What is Kustom Art, you may ask? Well let me tell ya! Kustom Kulture art came out of the culture of people that are fascinated by Americana, the culture of the 50’s and early 60’s, when cars were cool, girls were hot, and guys styled their hair with dippity doo. The Kustom Kultures of today have several different interests and styles but they all come together on transportation. We’re talkin’ cars and motorcyles, baby! A lot of Kustom Kulture, as you may have already surmised, is built around cars. If you haven’t heard of Robert Williams or Dean Jeffries, maybe you’ve heard of Von Dutch or Ed Roth. And let’s not leave out the amazing Barris Brothers and Lyle Fisk! All these guys helped to make the Kulture what it is today. I encourage you to research them further! Kustom Kulture is a creation that was borne of several other cultures— the punk rockers, drag racers, hot rod fanatics, and the kitschy Americana stuff like Route 66 nostalgia, American Graffiti, Bettie Page, and 50’s horror flicks! Kustom Kulture is an American neologism used to describe the artworks, vehicles, hairstyles, and fashions of those who drove and built custom cars and motorcycles in the United States of America from the 1950s through today. It was born out of the hot rod culture of Southern California of the 1960s.In the early days of hot rodding, many fashions and styles developed. Over time, each of these distinct styles of customizing have blended and reshaped our everyday life. Artists such as Von Dutch (Kenny Howard), Robert Williams, and custom car builder Ed “Big Daddy” Roth; along with Lyle Fisk, Dean Jeffries; hot rod and lowrider customizers such as the Barris Brothers (Sam and George Barris); along with numerous tattoo artists, automobile painters, and movies and television shows such as American Graffiti, The Munsters (The Munster Koach, Drag-u-la) have all helped to form what is known as Kustom Kulture. Kustom Kulture is usually identified with the greasers of the 1950s, the drag racers of the 1960s, and the lowriders of the 1970s. Other subcultures that have had an influence on Kustom Kulture are the Skinheads, mods and rockers of the 1960s, the punk rockers of the 1970s, the metal and rockabilly music, along with the scooterboys of the 1980s, and psychobilly of the 1990s. Each separate culture has added their own customizations to the cars, their own fashions, influenced the music, and added their own ideas of what is cool, of what is acceptable, and what is not. Everything from wild pinstriped paintjobs, to choptop Mercurys, to custom Harley-Davidson and Triumph Motorcycles, to metal-flake and black primer paint jobs, along with music, cartoons, and monster movies have had an impact on what defines anyone and anything who is part of this automobile subculture. 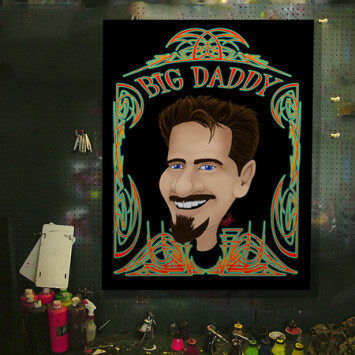 Check out these links to some of our Kustom paintings!